Damn, y’all, I am behind! So much going on. Let’s get started! Inner Moonlight has been such a blast! In April, I’ll have an anniversary show featuring as many of the past poets as possible. These amazing folks have all come through since the last post: Sebastian Paramo and Caitlin Pryor, Paul Koniecki and Nadia Wolnisty (check out this article about them from D Magazine), Megan Peak (check out this review of her book), Trista Edwards and Bess Whitby, Darius Frasure and Bear Rodehaver, and Aaron Glover and Emmy Piercy. Up next on March 13, we’ve got Alejandra Ramos Gomez and Reverie Koniecki. The anniversary show on April 10 is gonna be a poetry party, so if you’ve missed any shows, that’s the night to come out and behold what a fantastic year we’ve had! Script had some great things happen. 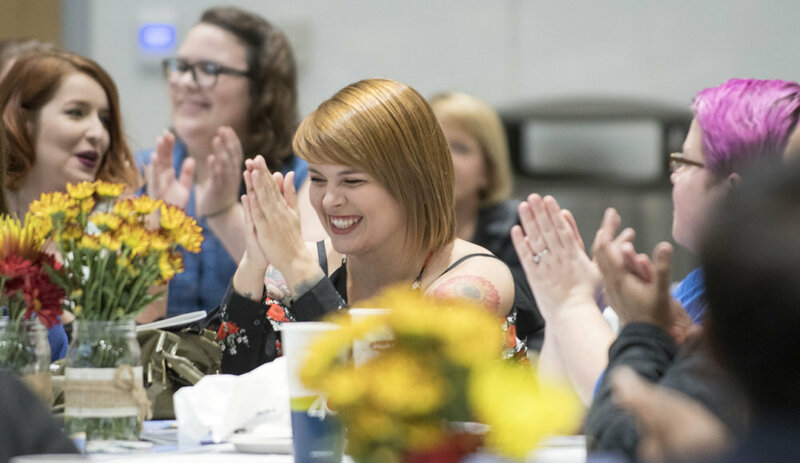 Our Awards Night for the 2018 issue had a great turnout and the Collegian kindly covered it and posted some photos. I also got word that the Community College Humanities Association selected our 2017 issue as first place for best magazine in the southwest region! We are so proud. My ENGL 2389 students and I are hard at work on the 2019 issue. I can’t wait to share it with y’all! I taught a workshop about the magic of the sonnet at the Marine Creek Creative Writing Conference at TCC Northwest. This free event is always excellent! Thanks to Sebastian Paramo and Mag Gabbert for featuring me at their Pegasus Reading Series back in December. I had a blast and it was an honor to read with such excellent folks! I’ve also got another round of my ekphrasis workshop coming up for the Writer’s Garret. It’ll be April 27, so go on and sign up! It’s super fun. Voicemail Poems is back after a hiatus. We take rolling submissions so call us up! Stoked to put out a new issue so stay tuned. I’m sending out that manuscript, so seriously, y’all, all the good vibes. Take care of yourselves out there. I’ll be back eventually with more good news. A million updates, as usual. I survived my first academic year as Professor Cure. I am profoundly exhausted but y'all, it was so worth it. I am so proud of my students. 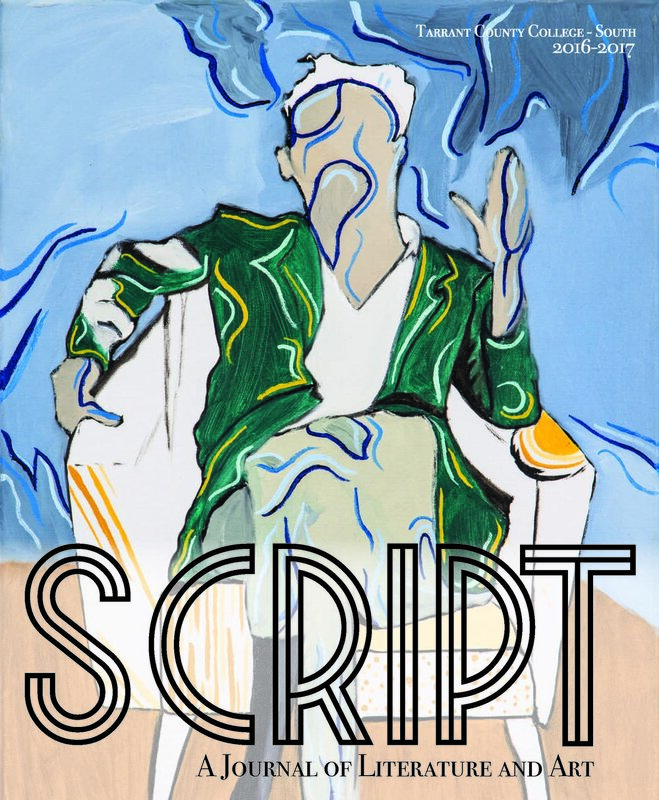 The newest online issue of Script dropped and it is gorgeous. Click the cover art below to check it out! I am taking summer off and I am beyond excited. I have plans to work on my manuscript and read all the poems. It's going to be amazing. In other news, we did put out that Winter 2018 podcast episode. I am sad to say it will be my last. I am still an editor for VMP, I'm just not working on the podcast anymore. It was super fun but I had to be real with myself about what I can reasonably take on. That's a tough balance as an artist. Sure y'all can relate. We put out our Spring 2018 issue and it's fire! Very proud of it. Remember how I said I was going to read for Spiderweb Salon? I did. It was truly one of the most bizarre experiences of my life and I am so glad they included me. Inner Moonlight with Lauren Brazeal and Stevie Edwards was absolutely everything I hoped for and more. They were both incredible readers and I am so damn happy I got to feature them and promote their work. I reviewed Lauren's brand new book Gutter and let me tell you, it is stunning. 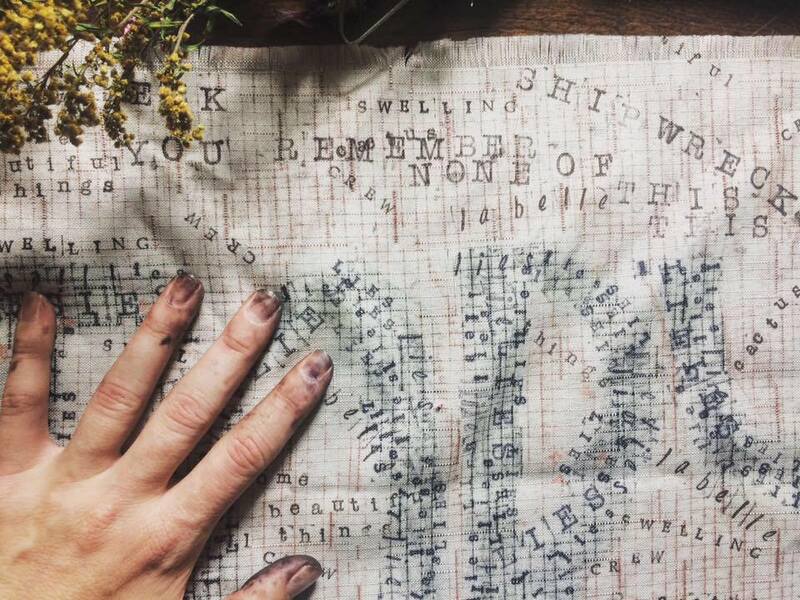 Wild Detectives contributor Katy Dycus reviewed Stevie's latest book, Sadness Workshop, and it is equally beautiful. I picked up both books during the reading. Get on down to Wild Detectives so you can get them for yourself! I also featured for a new series called Meet Me With Curiosity on May 5. It's an outdoor showcase at Klyde Warren Park in Dallas. It was an honor to be invited. Also, the long-awaited Southern Poetry Anthology: Texas from Texas Review Press is finally out! My poem "Supernova" is in it. Get yourself a copy! Upcoming: the next Inner Moonlight is June 6 at 7:30PM. We've got Courtney Marie and Fatima Hirsi presenting their joint chapbook. I can't freakin' wait. I should also have a second edition of Letters to Petrarch out soon! More on that later. Y'all be good out there! Our next show is May 2 at 7:30PM, featuring Lauren Brazeal and Stevie Edwards! Can't wait to see you there. Also, I've got my Craft and Confession workshop coming up this Sunday, April 8th at 1PM at the Writer's Garret. It's going to be super fun! I'll be featuring for Spiderweb Salon at their Very Rare! Show in Dallas on April 14th! Drop them a line if you want a formal invitation with more details. In other news, I've got a little zine in the White Rock Zine Machine right now, located at Deep Vellum Books in Dallas. This set of zines is in collaboration with the Fort Worth Art & Words Show. I had a poem, "Pareidolia," come up over at Mad Swirl. The Winter 2018 issue of Voicemail Poems is out, and the podcast episode will come up soon. Our Spring issue is coming soon! Stay tuned for more good news. Y'all be good out there! As always, I have a ton of updates for y'all! I.S. Jones and I dropped that Fall 2017 podcast episode for Voicemail Poems. Check it out! Our Winter issue is forthcoming. Also, I survived my first semester as Professor Cure. It was intense, I'm not going to lie. 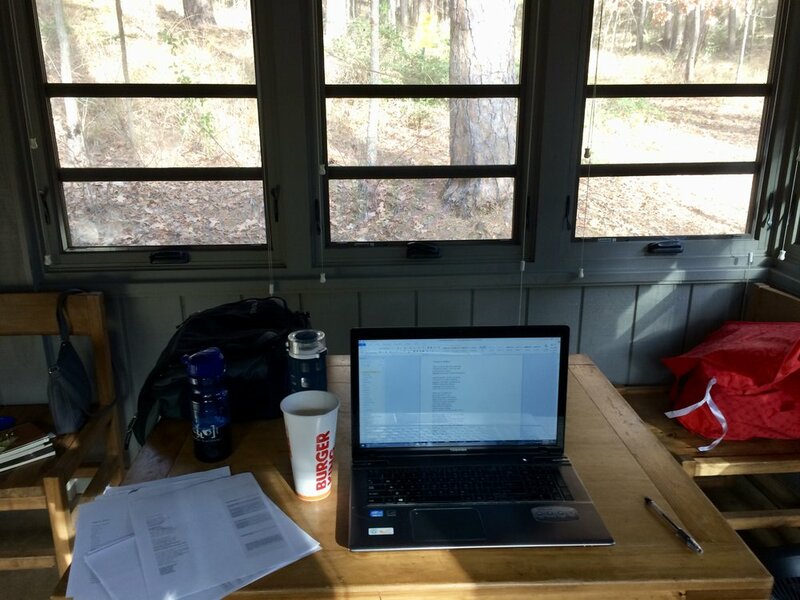 As soon as finals ended, I stayed the weekend in a cabin at a state park so I could work on my manuscript, as evidenced by the photo below. I made some excellent progress and I'm feeling optimistic about the project. Speaking of optimism, I can't wait for the Spring semester to start so I can make another issue of Script with my students! Speaking of TCC, I gave my Craft and Confession workshop for TCC-Northwest's Marine Creek Creative Writing Conference back in November and had a blast doing it. I should have another offering of that workshop via the Writer's Garret this Spring, so stay tuned for more on that. In other news, two of my West Texas pieces, "Coyote" and "Santa Rita, 1921," found a home in Weaving the Terrain, an anthology of 100-word poems about the Southwest, from Dos Gatos Press. You should get yourself a copy! You know, 2017 was a pretty crazy year. Here's hoping 2018 is excellent. Y'all take care of yourselves out there. Y'all. I have been crazy busy. I have so many updates! Script celebrated Awards Night! This year's issue is gorgeous and I'm so happy we got to honor the contributors and editors. I am so proud of our students. Check out this beautiful photo below, compliments of the Collegian. Voicemail Poems dropped its Fall issue today. Stay tuned for my podcast follow-up! Other upcoming things: my Terrible Poetry workshop for the Writer's Garret, this Saturday October 14. Check out this interview they did with me where I talk about things you should definitely read and admit one very unpopular opinion. I will also be reading for Pandora's Box on Friday October 20th, 7PM at Deep Vellum. This is another collaboration called "bread crumbs." A group of poets writes a chain of pieces that are inspired by/related to one another. The reading is pretty neat and it's fun to create alongside such talented folks. Looking forward to it! I also found out that I will have a couple poems featured in an anthology of 100-word poems about the Southwest, published by Dos Gatos Press. More on that later. I am always, as ever, a very lucky poet. Y'all be good out there. So this is probably my best news for y'all yet: I'm going to be a full-time English faculty member for TCC-South in the Fall! I am absolutely thrilled. I will keep working on Script and I will get to stay at the campus that's been home for 4 years. This is the dream. Truly. I cannot wait. In other news, I'll be participating in a roundtable discussion about MFA programs at Deep Vellum Books, Sunday July 23 at 1PM. The event is free and I will be joined by a panel of some of my favorites to talk about our experiences. If you're in DFW and you're wondering if an MFA is right for you, come see us. Also, I'll be teaching my Terrible Poetry workshop for the Writer's Garret, October 14 from 12PM to 3PM. This workshop is a lot of fun. We see who can write the worst piece in the room and then we talk about how to make awful drafts into good poems. Join me! That's all for now. Y'all be good out there. In other news, I'll be participating in the Deep Ellum Lit Hop again this year, June 3 at venues throughout Deep Ellum. I'll be in the Pegasus Reading Series show at Kettle Art. This event was a blast last year and I can't wait to be a part of it again! Also, I found out I'll be participating in the Art & Words show this year! I've participated in the past and loved it. Opening night is October 7. I'm so looking forward to it. I have more good news coming soon. Some poets have all the luck. Y'all be good out there. So much news to tell! First, my poem "Permian Sea" came up over at Split Rock Review. Honored to be included in this gorgeous magazine. Y'all know I love making audio, so I'm happy they asked me to record myself reading the piece. I also love poems about place, so this magazine is perfect. Also, Spiderweb Salon included me in their National Poetry Month celebration! Check out the poem and prompt I provided for them. This collective is such a gift to our literary community. So happy to know them. They also gave "This is not my first grey hair" a new place to hang out on the internet, so I'm glad about that. You didn't think I'd make a news post without mentioning Deep Vellum, did you? They also highlighted me and my work for National Poetry Month. So pleased to be described as a Deep Vellum Books favorite; the feeling is so mutual. I wrapped up my online Poetic Imitation and Innovation course for the Writer's Garret. It was a blast! I had a great group of students. One of them had this super kind thing to say: "Loved the instructor and valued her insightful feedback. The model poems she chose made the imitations challenging. She had a way of emphasizing what was working as well as how to take the poem to the next level. I'd love to study under Logen some more." I'll let y'all know if I have more workshops coming! I also participated in a fantastic reading called Other People's Poetry. We read the entirety of Adrienne Rich's The Dream of a Common Language. It was such a lovely, powerful experience. D Magazine did this pretty sweet write-up about it. Many thanks to organizer Joe Milazzo for making it all happen. Happy 5th birthday to Voicemail Poems! The Spring 2017 issue is underway right now. Get ready for my podcast follow-up! I'm really stoked about it. I've got a reading coming up for Pandora's Box! April 21, 8PM, Deep Vellum Books. Be there! I'll read to you, you'll be surrounded by books and lovely, talented people. It'll be a beautiful thing. 'Til next time. Y'all be good out there. I had a great time at the Pandora's Box Christmas show! I am ever so grateful for the community Pandora's Box creates. Deep Vellum is a truly beautiful bookstore and I'm so glad it came into our lives. They sold out of my books and I gave them more. If you're looking for a holiday gift and a way to support a local business, you know what to do! In other news, I had a poem come up over at Mad Swirl. Always a pleasure to be in mad company! The next episode of the Voicemail Poems Podcast is also live! I had the pleasure of talking with fellow editor Amy Saul-Zerby about three outstanding poems from our Fall 2016 issue. If you'd like to support VMP and this podcast, please SHARE, join our Patreon, and review us on iTunes. Also SUBMIT! The deadline for the next issue is December 15. I'm looking forward to the Poetry March on December 18! Stay tuned for a recap of that and more good news. Y'all be good out there. The Dallas Texas Poetry Calendar show was a blast! The holidays are coming, y'all! This anthology makes a great gift. My Terrible Poems workshop for the Marine Creek Creative Writing Conference was also a ton of fun. TCC-Northwest hosts this event every year and it's terrific! If you missed it this year, be on the look-out for it next Fall. In other news, registration is currently open for my Spring course at TCC-South! It's ENGL 2389, the academic cooperative, where my students serve as the editorial staff for Script. If you've got credit for ENGL 1301, composition I, you're eligible! Come make a magazine with me! Use the CONTACT form if you want to know more. Also, I'll be joining Pandora's Box for their Christmas show this year! It'll be December 9 at 8PM at Deep Vellum Books. Deep Vellum is also hosting the Poetry March December 18. Check it out! Get involved! It's important. More to come. Stay strong out there, y'all. Y'all! 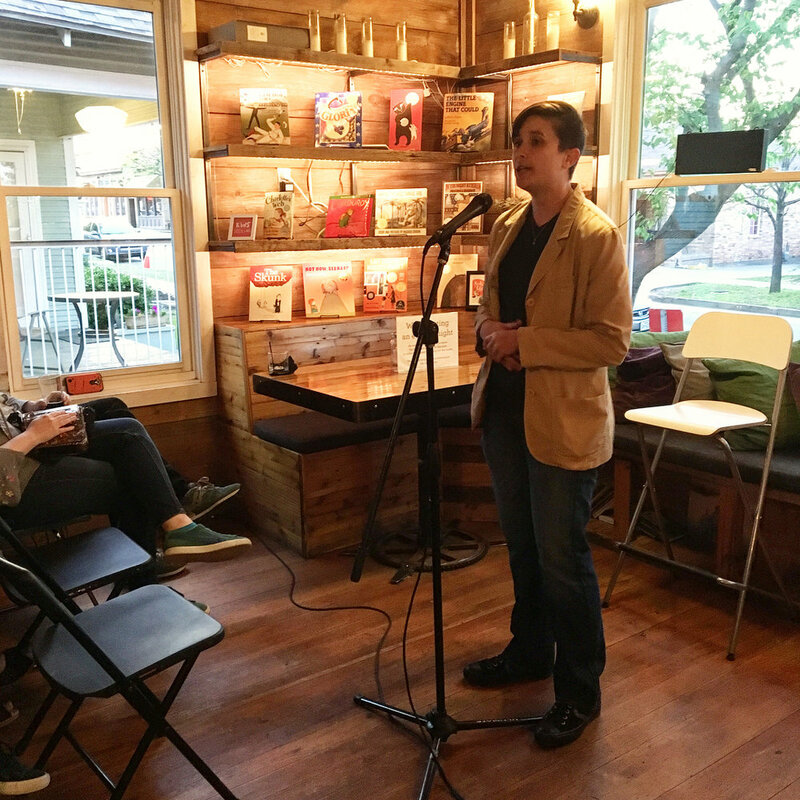 I had a blast reading in San Antonio for the Texas Poetry Calendar. The Twig was beautiful, as you can see from the photo below. It was my first time reading in San Antonio. I was happy to meet some of the local talent and honored to be included among so many excellent poets! Many thanks to the editors for putting it all together and hosting the show. I'll join the Texas Poetry Calendar folks again for their Dallas reading, Friday November 4th at 7PM at the giant Half Price Books off Northwest Highway. Be there! In other news, I will be teaching my Terrible Poems workshop for the Marine Creek Writing Conference on Saturday November 5. It's hosted by Tarrant County College's Northwest Campus. It's fabulous and FREE. Contact mary.lounsbury@tccd.edu to register. Y'all, I had a blast participating in the Houston Poetry Fest as a juried poet! I arrived Friday, attended the kick-off event and the first evening reading. I got to see my friend Tria Wood read among some other fabulous poets. I attended the open reading on Saturday afternoon and I was in the juried poet line-up for that evening. I attended HPF as a juried poet in 2013; it was lovely to see so many familiar faces and make some new friends as well. Many thanks to my friend Toni Holland for the video below. That's Tria's amazing purple hair. I read a bit from both my recent chapbooks. I hope you enjoy! I've got a couple readings coming up for the Texas Poetry Calendar. Y'all stay tuned for those recaps! Great news, y'all! Easy Street Magazine nominated my poem "Laws" for Best of the Net! Honored and thrilled about this. Many thanks to the editors, particularly Camille Griep, who was lovely to work with. Keep your fingers crossed for me! In other news, Voicemail Poems kicked off the Fall 2016 issue yesterday. I am so damn proud to be a part of this magazine. Stay tuned all month for a new voicemail every weekday! I'm getting ready to head to Houston for the Houston Poetry Fest! I was selected as a juried poet for this year and will be reading 7:30PM Saturday October 8 at the Willow Creek Pump Station. I was a juried poet in 2013 and had a blast. I'll write a recap for y'all like always, so get ready! Been busy, lately, y'all! I participated in two readings for the Dallas Poets Community Cattlemen & Cadillacs anthology, one at the big Half Price Books in Dallas and one at the Benbrook Public Library. Both were a blast! DFW is home to so many amazing writers and I'm honored to be included in the anthology. 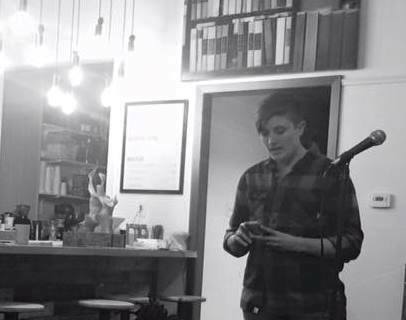 I also participated in the LGBT reading for Pandora's Box Poetry Showcase. Thanks to Christopher Soden for including me! We did this super cool radio show with KNON 89.3 to promote the reading. You should listen! In other news, I reinstated the podcast for Voicemail Poems! I made an episode highlighting three outstanding poems from the summer 2016 issue. The fall issue will roll out during October and I'll follow up with the next episode. I hosted a literary radio show back in college and I'm stoked to get back to making this sort of thing. Take a listen! I get real nerdy about how much I love the poems. Script threw its awards night last Friday! The editors and contributors brought their families, we had dinner, and celebrated everyone's accomplishments. Special guests included former faculty editors and a former student contributor who spoke about their experiences and shared their work. So thrilled and proud to serve as faculty editor for Script. My students are relentlessly inspiring. Check out this awesome photo, compliments of the school newspaper, The Collegian. Yes, I'm wearing the cover art as a cape. Read the full article here. More good news to come. Y'all be good out there! Y'all! So many good things happening. On Friday July 29, I went to a show in Oak Cliff put on by Poets on X+ host Opalina Salas. It was this crazy long fantastic open mic with sing-alongs and shenanigans. The Lit Hop was a great success and I hope we do it again next year! The Dallas Poets Community is gonna do a reading this Friday August 5, 7PM at the giant Half Price Books in Dallas to celebrate their anthology. I'll be there! Also, I had this poem come up over at Rogue Agent. Honored to be included in this lovely magazine. Til next time y'all. Be good out there.